Dr. Sproul recently joined the Clinical Psy.D. program at the Chicago School of Professional Psychology, DC Campus. She received her M.Ed. and Ph.D. in School Psychology from Temple University in Philadelphia. She also earned a master's in Educational Psychology from Howard University and bachelor's in Psychology from Northwestern University. Dr. Sproul specializes in working with children, adolescents, and young adults. She has provided services and consultation to children, families, and teachers in schools and behavioral health settings. Among those services has been extensive work with children with disabilities including those on the autism spectrum. Dr. Sproul typically teaches courses in assessment, psychometrics, and statistics. 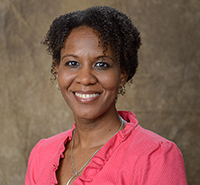 In addition to teaching, she assists students with academic advising and dissertation research. Dr. Sproul previously taught in the Counseling Psychology Masters program at the University of Pennsylvania and Temple University's psychology department. Her professional interests include administration and development of psychological and educational assessments, children with special needs, and early childhood education. She has presented at numerous national conferences and continues to pursue an active research agenda focused on underserved populations.